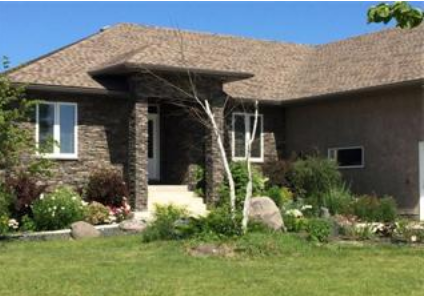 Basement: Yes, Full "Fully Finished "
Absolutely amazing custom built bungalow on a beautiful 1.1 acre landscaped lot just 15 minutes west of Wpg (lower taxes). Long list of special features/extras including over 2200 sq feet on the main floor, a huge attached, heated and insulated garage that is over 2000 sq ft and could hold up to 10 cars easily. The home features a unique 425 Sq Ft four season sunroom with 15 ft high pine vaulted ceilings, huge windows, a granite mini-bar, maple cabinets, in-ceiling audio and a 6 person hot tub built into the tiled floor.Outstanding RR with huge home theatre room, large bedrooms, full bath. Deluxe master suite on main floor with 6 piece ensuite and custom tiled shower. Fantastic, panoramic views of the well treed backyard from the sunroom or the large 780 sq ft of decks. Fully landscaped, huge driveway.K-6 school within walking distance. This is the definition of a "dream home." Ideal for business owners with large motorized vehicles,RV's, trailers etc. Absolutely must be seen to be appreciated!